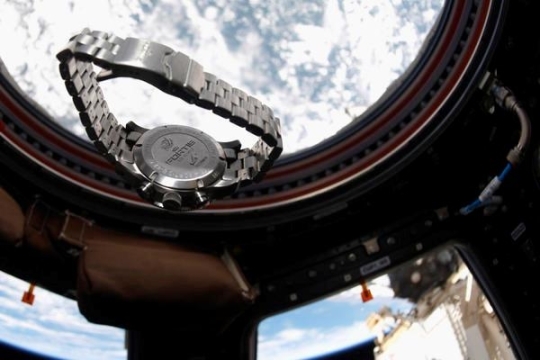 It’s about time a watchmaker saw the light about night visibility. 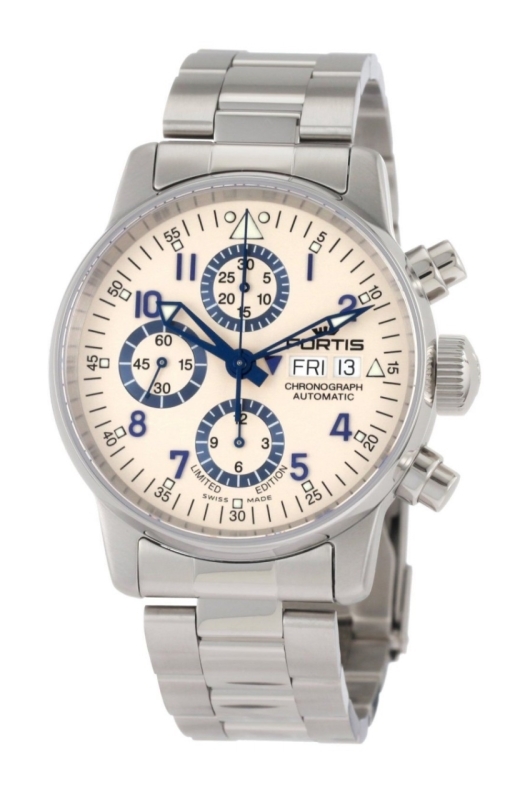 One of the reasons that Fortis timepieces have always been favored by pilots, sailors, adventurers, and even astronauts is that for over 100 years, Fortis has been dedicated to meeting the needs of working professionals. When you depend on a watch as a professional timing tool instead of just wearing it as a fashion accessory, one of the things you need the most is perfect legibility under any conditions. 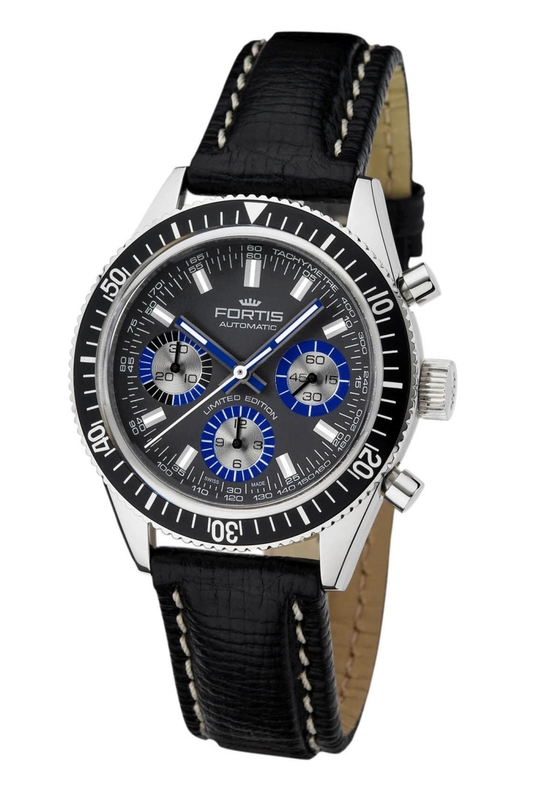 The impressive Fortis Nocturnal solves the age-old problem of night visibility in an entirely new way. 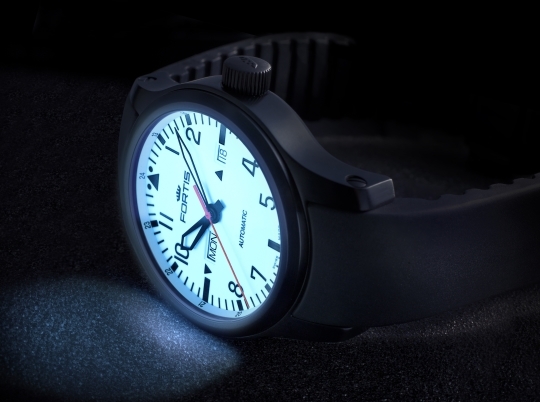 Instead of painting the hands and indices with a luminous material, Fortis has found a way to light up the entire dial. To provide maximum visibility at night, the entire dial of the 42 mm Fortis Nocturnal has been coated with a white Superluminova material that has a highly visible green afterglow at night. 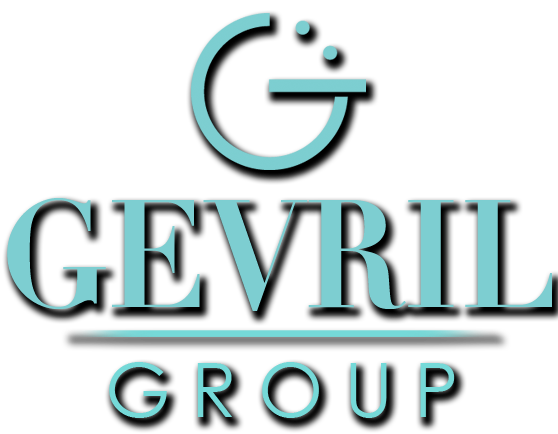 This innovative alternative to faintly glowing hands and numbers, provides you with a brightly lit dial that is as easy to read at midnight as it is at noon. 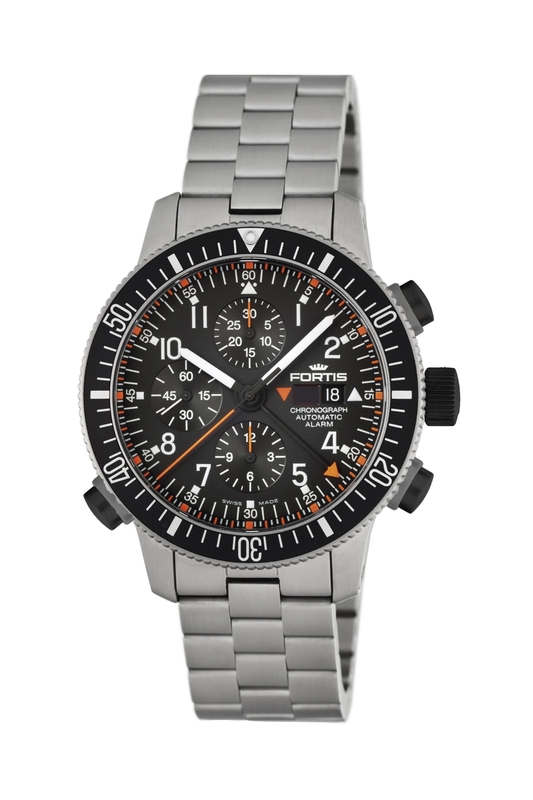 The combination of unprecedented night visibility with a large, clearly marked dial makes the Fortis Nocturnal an ideal timepiece for pilots, aviators, and other professionals. Everything about this watch, from the large skeletonized sword hands, to the 24-hour scale on the chapter ring, to the oversized day and date windows with convenient directional setting arrows, was designed to make this superb timing tool as easy-to-use and read as possible. 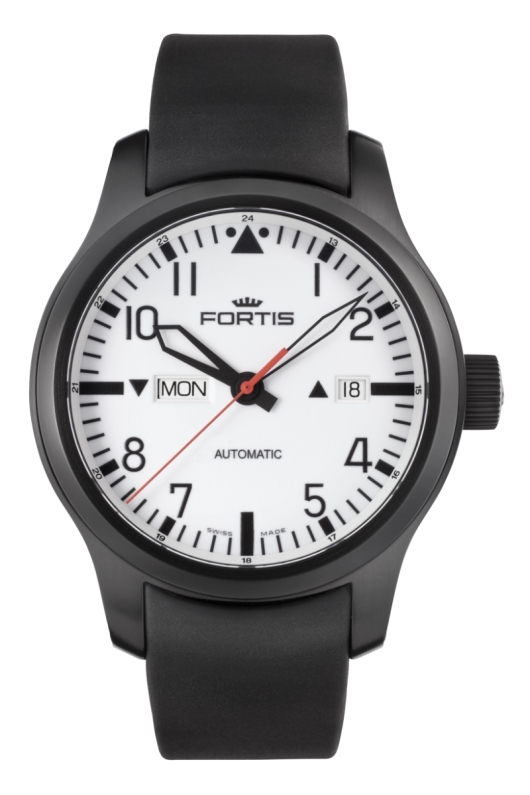 The Fortis Nocturnal is powered by a precision Swiss made ETA 2836-2 automatic movement that has been encased in a rugged black PVD coated stainless steel case that is water resistant to 669 feet. The scratch resistant sapphire crystal is coated on both sides with a special anti-reflective material to eliminate reflections and glare. There is an exhibition back so you can see the intricate movement at work, and even a bilingual day indicator that allows you to read the day in English or German. To configure this amazing timepiece to meet your own personal needs, the Fortis Nocturnal can be fitted with your choice of a premium topstitched leather strap, a leather performance strap, a beautiful black PVD coated stainless steel bracelet, or a comfortable black caoutchouc band. Like all Fortis timepieces, the Nocturnal is presented in a beautiful leather box and carries a two-year manufacturer warranty. 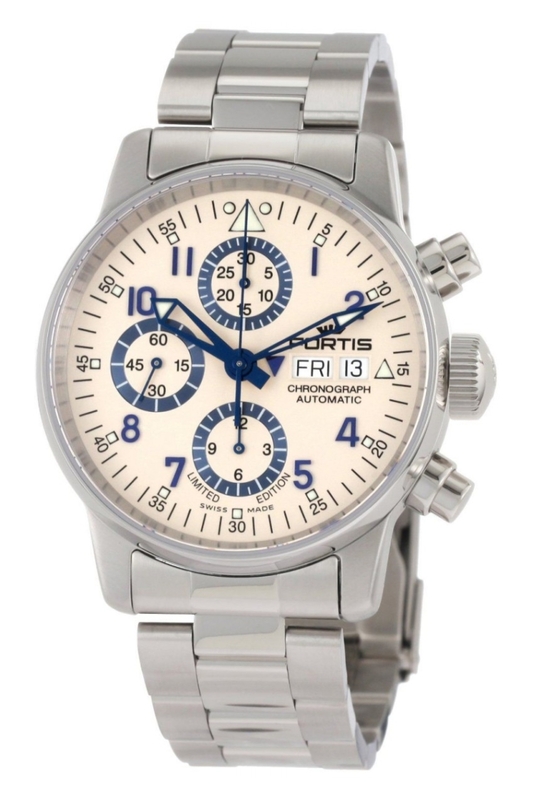 If you’re tired of being in the dark whenever the light grows dim, you need a Fortis Nocturnal on your wrist. The Nocturnal is a great aviator style timepiece at any time of day, but after dark, it really begins to shine. 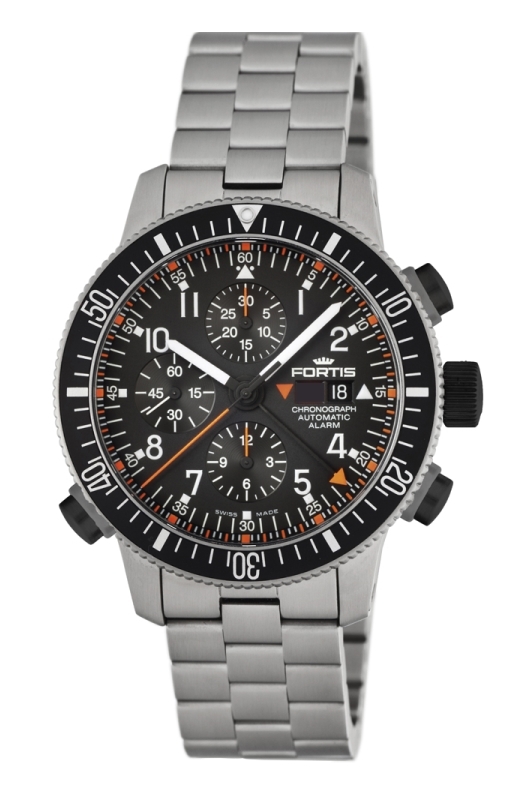 When you’re ready to see the light, just contact an authorized Fortis dealer and ask to see the Nocturnal.